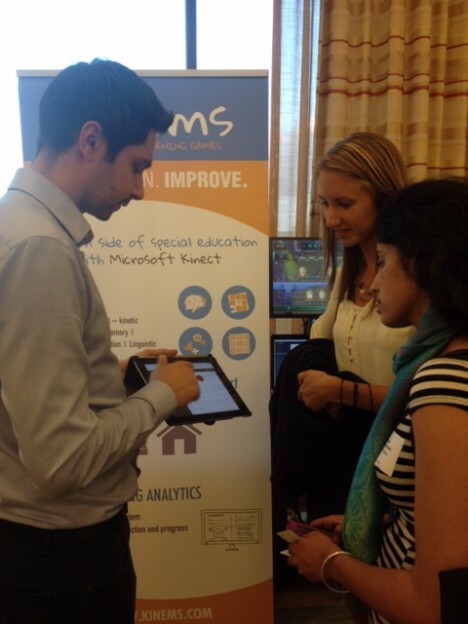 Kate Anderson and Nithyaa Venkataramani learning about Kinems data tracking technology that teachers can use to monitor their students’ progress as they play these games. They are speakin with co-founder Michalis Boloudakis. Last Wednesday, Nithyaa Venkataramani, a Talent Fellow here at New Profit, and I ventured over to the Seaport World Trade Center in Boston to attend the MassChallenge Startup Showcase--an annual event featuring the 128 startups selected to participate in this year’s MassChallenge Accelerator Program. The MassChallenge Accelerator Program seeks to accelerate the growth of early-stage startups through providing mentorship and additional resources. Over 600 people participated in the event, which included social entrepreneurs (SEs), investors, mentors, startup enthusiasts, and more. The startups were a mix of for profits and nonprofits with missions ranging from energy and sciences to healthcare and social impact. Nithyaa and I spent the majority of our time speaking with SEs representing social impact startups. A couple of highlights included speaking with Jared Chung from CareerVillage--an online platform that crowd-sources career advice for students in low income communities. CareerVillage seemed like a great resource for students receiving services from organizations in our Pathways portfolio, which specifically focuses on strengthening education to employment pipelines. We also spent time speaking with Michalis Boloudakis, a co-founder of Kinems Learning Games, and, of course, trying out some of the games ourselves! Kinems games are designed for students with disabilities, and integrate academic learning with improving fine motor skills. In the picture, we are learning about the Kinems data tracking technology teachers can use to monitor their students’ progress as they play these games. Both Kinems Learning Games and CareerVillage were great examples of the ways technology is bringing social innovation to a whole new level by using data to create personalized programming that ultimately results in more efficient and effective social services. It was inspiring to see so many SEs creating products that will truly make a difference in our world, and it made me excited to learn more. So, upon leaving I signed up for the next MassChallenge Showcase, which will feature female-founded Finalist and Alumni companies. The event is free and takes place next Wednesday, August 13th, from 6pm-9pm in Boston. To learn more and to sign-up, visit the MassChallenge events website: http://masschallenge.org/events.